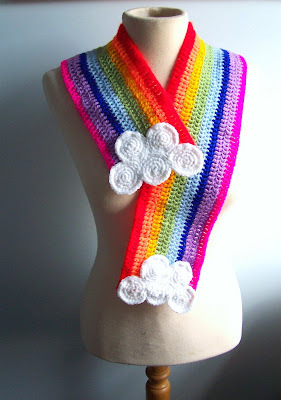 house of spoon: wrap up in a rainbow! Well my heart was deeply touched by all the pics of poor lil'pill among the snow of icy germany so i decided to make her a scarf worthy of someone with her Ravebabe/Rob-bob background...ie it had to attract attention. (sorry the pic is pretty poor! The scarf is much longer but i let it hang down at the back so that it sat nicely for the photo!) The scarf was worked in rows of double crochet and the clouds are 5 circles worked in single crochet and then sewn together into roughly cloudy-type-shapes. Gil doesn't fool me for an instant! All the cold weather is right here not where she is, so in that case I'll just make use of that lovely jubbly scarf for her!! June. Think carefully before you go making wool bikinis - beautiful though they would doubtless be - water has a strange effect on wool!